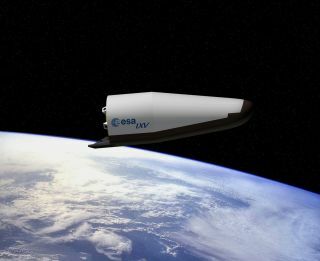 Artist's impression of the European Space Agency's eXperimental Vehicle (IXV). The launch of a robotic space plane prototype in November could pave the way toward the creation of a reusable cargo vehicle that would survive the blistering re-entry into Earth's atmosphere, according to the European Space Agency. ESA officials plan to launch the unmanned space plane, called the Intermediate eXperimental Vehicle (IXV), on a Vega rocket in early November. The flight plan calls for Vega to make an eastward flight — different than its usual polar orbit track — to release IXV into a suborbital path that would end in the Pacific Ocean. Technicians do final tests on the European Space Agency's Intermediate eXperimental Vehicle (IXV) ahead of its expected launch in November 2014. "In this mission we are not only monitoring the spacecraft all along its autonomous flight, but also tracking its progress back to Earth to a particular spot – this is different [than] what we are used to," Giorgio Tumino, the project manager for IXV, said in a statement. IXV will include sensors and infrared cameras to examine how heating is distributed across the belly of the spacecraft. The space plane will also fly with new technologically advanced features. "The technical advancements that have been made since the first experiments with our Atmospheric Reentry Demonstrator in 1996 are huge," Jose Longo, ESA's head of aerothermodynamics, said in the same statement. "This is the first flight demonstration of features such as highly advanced thermal structures: thrusters and flaps that are part of the control system, and the 300 sensors and infrared camera to map the heating all along the spacecraft from the nose to the flaps. These things just cannot be tested in the same way in laboratories." ESA is also going to test an infrared camera on its final automated transfer vehicle (ATV), called Georges Lemaitre, on a mission launching to the International Space Station Tuesday (July 29). You can watch the ATV launch live on Space.com via NASA TV starting at 7:15 p.m. EDT (2315 GMT) Tuesday (July 29). The ATV is designed to break up in Earth's atmosphere during re-entry after it leaves the space station about six months after it docks, according to ESA. For the first time, ESA plans to track the spacecraft's re-entry using a special infrared camera. The camera will transmit information to a special pod designed to survive re-entry, which will then send the information on to Earth through the Iridium satellite network.